Pork shoulder cooked for 10 hours, with toban jhan and a sticky miso maple glaze. Inspired by recipes from Japan & Korea. Ready to eat in 30 minutes Serves 2. Our pork shoulder has been marinated in a toban jhan paste before being slow cooked for 10 hours for you so the meat is succulent and tender; all you have to do is finish in the oven with the miso maple glaze for 30 mins. Our pork comes from British outdoor bred pigs, housed in straw bedded airy barns. 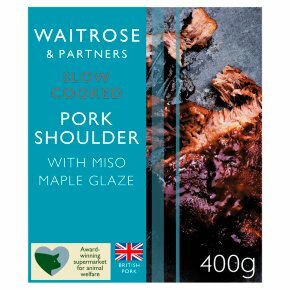 INGREDIENTS: Pork shoulder (80%), water, maize glucose syrup, fermented red chilli, sugar, fermented broad beans, rice wine vinegar, fermented soya bean, maple syrup, salt, soya bean, diced onion, sunflower oil, cornflour, red miso (soya beans, sugar, water, salt, wheat), garlic, brown sugar, ginger purée, mirin.